Locally-grown orchids add an exotic detail to any bouquet. 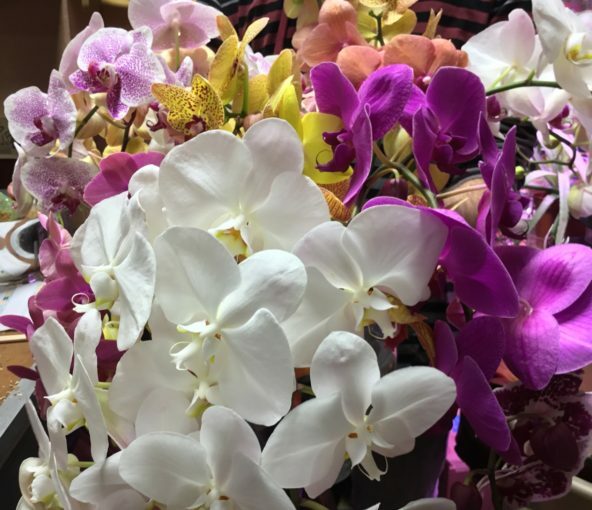 We’re fortunate that Orchids by Hausermann is located only 40 minutes away from us. They’re one of the largest growers of orchids in the USA specializing in unusual varietals and cattleya orchids. They also grow hundreds of different varieties of phaleonopsis orchids. These freshly-cut stems of orchids arrive into our design room every Wednesday morning before we even arrive. Every week offers a surprise in terms of what colors we’ll receive. In addition to using these in our daily designs throughout the week, we also use them often times for corsage and wedding design. Their bold impact, long life and their almost shimmery surface make them very popular with our clients. At holidays such as the quickly approaching Valentine’s Day, we’ll get as many as 100 stems in just a day or two before the 14th to assure the freshness. So the next time you’re looking to impress you special someone, give us a call and ask about adding a stem or two of orchids to your bouquet.